I loved spending time with my grandmother as most of you know as I've written about my grandparents many times. Not a day goes by that I don't miss them and enjoy a memory or two about our time together. The kitchen was the heart of my grandmother's home and times spent in there with her have always been some of my favorite memories. I've tried to make our kitchen the heart of our home as well and I think I was successful as we still gather around the table to visit, share stories, play games, and enjoy food together. Our family is comfortable around the kitchen table. It's a place where we feel safe and relaxed. It's a place of love and zero judgment. We bring our true selves to the kitchen table because we know we are loved and accepted no matter what. 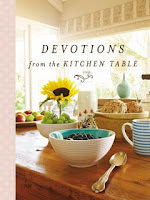 When I was given the opportunity to review, DEVOTIONS FROM THE KITCHEN TABLE, I knew it would be a good choice for me. I wasn't disappointed. I am usually disappointed in devotionals. When it comes to devotionals, I am usually disappointed. It seems they lean towards telling readers what to do and how to do it or sharing some story that seems more judgmental than helpful or they don't seem to relate to everyday life and then there are the ones that are just downright boring or written by people who don't seem to know their subject matter. Devotions from the Kitchen Table is fabulous! Yes, I'm picky when it comes to any book offering daily readings. DEVOTIONS FROM THE KITCHEN TABLE offers 90 daily readings that I found thought-provoking, funny, interesting, inspiring, and encouraging. Some entries took me right back to my grandmother's kitchen table. Even the photographs are appealing. There was something warm and cozy on every page. I went ahead and read through the whole book (90 devotions) and will now enjoy reading through each entry one day at a time. This is a devotional that won't end up in a yard sale. As a matter of fact, I think this one make a great gift for someone's birthday, Mother's Day, even a nice shower gift. The only thing missing from this book are the recipes to go with those amazing pictures! And maybe a bit of space on the sides for notes. I didn't want to write on the photos. They're just too lovely. Thanks to BookLook Bloggers for my copy of this lovely book. This review contains only my own honest opinions. The kitchen was the heart of my grandmother's home and the same for my growing up. Lots of good times spent around the kitchen table. Those times are some of my most favorite memories and the times I miss the most. Thank you! It was great growing up with the kitchen as the heart and soul of our family. I'm sad for those who don't have that. Kudos to you for continuing the tradition!! Thanks for the review! Glad you liked it. Yes I imagine having recipes would have been a nice addition to this book.